Battery Powered Aquarium Air Pump is a must have for all fish keepers. When was the last time you lost electricity to due a bad storm and your fish were left without oxygen? Be prepared with this battery powered aquarium air pump. 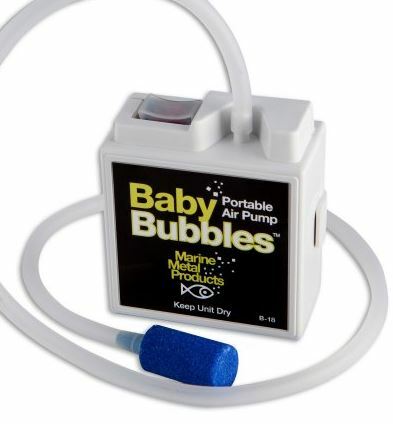 The battery powered aquarium air pump runs approximately 20 hours on 2 AA batteries! The pump comes with 2 feet of airline tubing and an air stone ready to work. It also has an adjustable clip to easily hang from a bucket during fish transport or to hang from the side of your aquarium. Works great in both freshwater and saltwater aquariums. Can also be used for live bait wells and buckets when you go fishing. This is a priceless piece of equipment that every fish keeper must have.